About a week ago, Lis posted a gorgeous recipe on her blog for Pasta Shells with Italian Tuna, Grape Tomatoes & Baby Spinach. After wiping the drool from my lips, I knew I had to make it. The only thing was that when I entered it into the WW points calculator, it said one serving equalled half my daily calorie allotment. The result is an enticing dish, perfect for casual-yet-elegant al fresco dining. I love that it’s served warm yet is still light enough for warmer weather. 1 bag of fresh baby spinach, about 6 oz. Bring a large pot of water to boil for the pasta and follow the directions for cooking the pasta as listed on the box. When water comes to boil, salt it generously, then cook pasta according to package directions, until al dente. Just after adding the pasta to the boiling water, heat 2 tsp. of olive oil over medium low to medium heat in a skillet large enough to incorporate all the ingredients (including the cooked pasta). Add garlic and saute until lightly golden. Add the tuna with the oil, artichoke hearts & tomatoes, sauteing until the tomato skins slightly wrinkle, about 3 minutes. 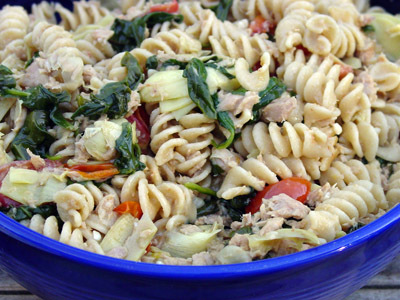 Just before your pasta is ready, add the baby spinach to the tuna mixture, folding in until the spinach is wilted. Finish the with a sprinkling of fresh pepper and some additional Pecorino Romano.